We were contacted by Janet in the first instance as she had seen our website. Once I had seen the kitchen pictures I was able to give an accurate quote. I was invited round to discuss and have a closer look and book the job in. A firm date was put in the diary that fitted in with them. 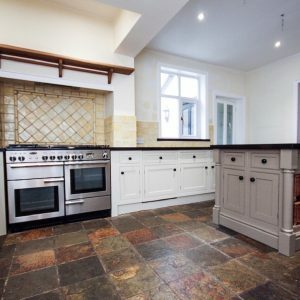 The colours Off White & Mouse’s Back were decided for the kitchen as well as the sheen level. We like to start early in the morning to beat the traffic if we can. 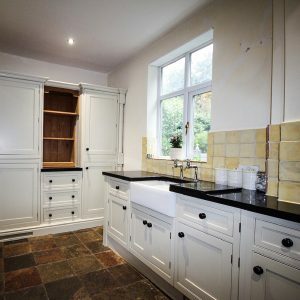 The first job on site is to number all the doors, drawers and anything that can be removed. The frames are also numbered so it all goes back in the same place. The worktops and floor are all covered with protective coverings so there’s no need for sheets anywhere. The next few days involve all the cleaning of the doors, drawers and frames so the kitchen becomes squeaky clean. Once everything has dried we then fill any damage to the kitchen units before lightly sanding it all using the latest in dustless sanding. With all the preparation done and all filled, caulked, it’s on with the high adhesion primer. This is the most important coat of paint. Once this is on and dry nothing will remove it, leaving us a perfect base coat for the two top coats. In the following days the top coats are applied insuring a beautiful finish. With all the doors and drawers being done at the same time in the workshop. 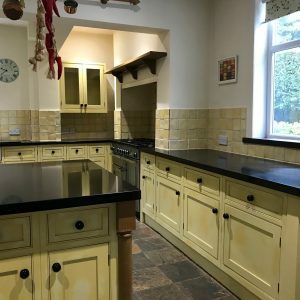 kitchen cabinet painter Christleton Cheshire. 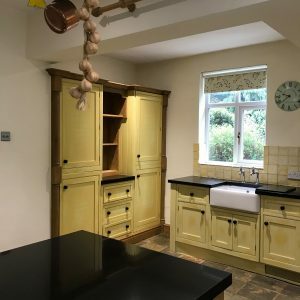 kitchen cabinet painter Christleton Cheshire.